Our 14 day Mozambique tour offers a great combination of Big 5 Safaris, spectacular Nature, diverse Cultures and stunning white beaches! On this overland tour we visit South Africa, Swaziland and Mozambique. 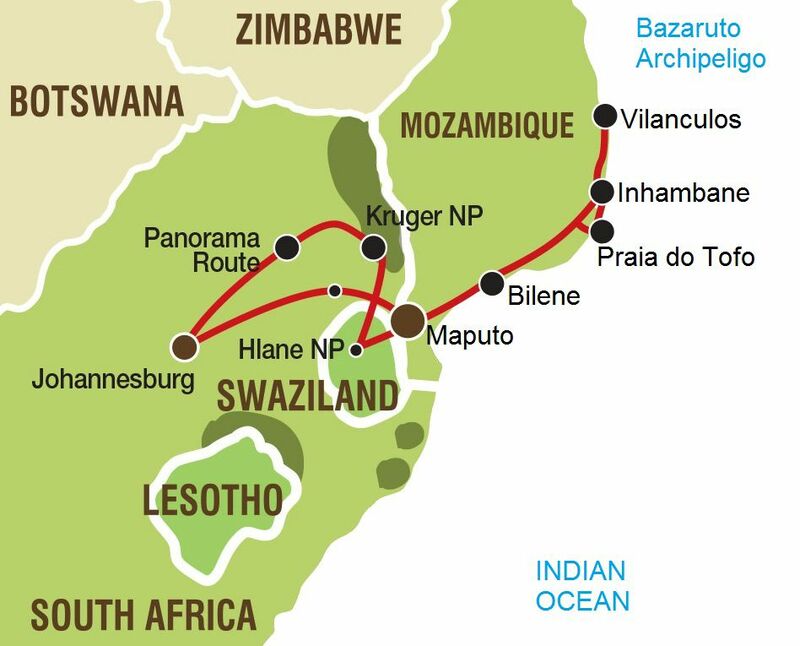 Highlights include the Kruger National Park, Hlane Royal National Park, Bilene, Inhambane, Vilanculos, Praia do Tofo to name just a few. On this tour there will be time for scuba diving and snorkelling. If you travel between October and March, you might even be lucky enough to snorkel with Whale Sharks! Click map to enlarge. We depart on our group tour of Mozambique as we leave the city of Johannesburg behind. We make our way east through the coalfields of the Mpumalanga province. Our journey today follows in the footsteps of the old trade-routes to the Lowveld and the Kruger National Park. This afternoon there will be an opportunity to join an optional sundowner drive. Booking is essential and your guide can assist on departure this morning. We have an early start this morning as we enter the Kruger National Park to enjoy a full-day of safari. The abundance of wild animals presents us with opportunities for excellent sightings, since the Kruger is also home to the famed members of Africa’s Big-5. Our activity package offers the added excitement of experiencing the park from an open-sided 4x4 safari vehicle. This evening there is a second opportunity for the optional Sundowner Drive. While those who choose to do the optional morning walk will have an earlier start, we set out a little later today and travel the short distance to the Panorama Route. Strung along the escarpment that divides the central plateau and low-lying bushveld of the Kruger, the sights of the Panorama Route offer us a day of scenic delights. We will visit the highlights of Bourke’s Luck Potholes, the Three Rondavels and God’s Window before returning to camp in the late afternoon. We set out early this morning as we journey via Maputo and cross the border into Swaziland. From the border we make our way to the Hlane Game Reserve where we will overnight. Our stay in Swaziland gives us with an opportunity to enjoy a morning game drive (safari) in Hlane Game Reserve, which is included for those guests who have purchased the activity package. After our safari, we depart Hlane and head to another great reserve of Swaziland, Mliwane.